Introducing the new Honda GL1800 Gold Wing; completely redesigned with a new chassis, engine and suspension system, nothing has been overlooked. Along with a big weight reduction comes 4 riding modes, DCT, Throttle By Wire and a host of other innovative and connected features, Honda’s flagship continues to reign supreme in levels of comfort and luxury whether you're in the city, or out on tour. Distinctive performance with an individual character all of its own, there is nothing like the Honda Gold Wing. 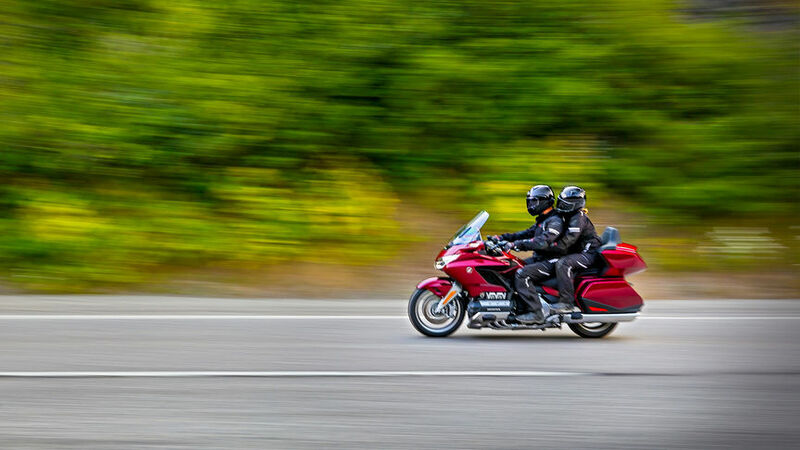 A new, horizontally-opposed, 1.833cc flat six engine, punches out an arm-tugging 170Nm of torque @5,500rpm – it's the very essence of the Honda Gold Wing. Now, 6.2 Kg lighter, with 4 valves per cylinder and Unicam heads, you get strong eager performance – via new Throttle By Wire – out on the highway, as well as a delicate throttle response when you need it around town. A completely reimagined and re-engineered chassis delivers agile handling. A much lighter, all-aluminium die-cast beam frame delivers agile handling, while up front, the long-standing traditional front fork has gone to make way for a double wishbone front suspension system. It’s 30% smoother and delivers a real plush ride wherever you go. The rear suspension is a redesigned Pro-Arm type – a first for the Honda Gold Wing – and works with the unique Pro-Link arrangement that provides high-level comfort. Rear spring preload is electrically adjustable to suit passenger and luggage with four different settings. Third generation, 7-speed Dual Clutch Transmission is specifically designed for the Lord of long-distance cruising. Extremely smooth and fast gear changes, DCT eliminates shift shock and has three modes of operation: MT mode provides you with full control and allows you to change gear manually using the trigger buttons on the handlebar. Automatic D mode is perfect for city and highway rides and delivers much better fuel efficiency. Automatic S mode is sportier and allows the engine to rev higher before shifting up for a more exhilarating ride. It will also shift down sooner for better engine braking. DCT in D mode works with you and can detect what environment you are riding in; adjusting accordingly between mountain roads and city streets. 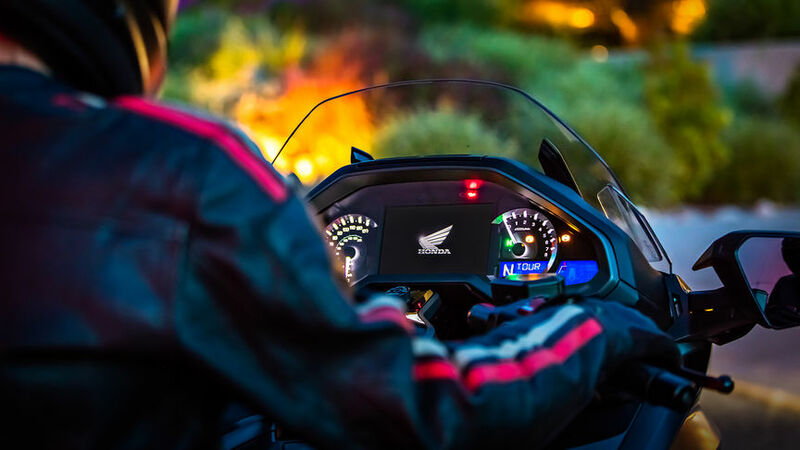 In addition, the Gold Wing comes with Idling Stop too – engine will stop after 3 seconds, restarting at the touch of the throttle – for improved fuel efficiency. And with Hill Start Assist, there’s no fear of rolling backwards or forwards on an incline – clever. Another innovative feature is the moderation of gear ratios. They’re closer together for slow speed and seamless changes, yet will set themselves wider apart at high speed to reduce engine revs – very clever. We’ve created a unique Integrated Starter Generator (ISG) that works as starter motor as well as a generator; saving weight and energy. The Gold Wing can creep along in walking mode forwards and backwards too, which is ideal for parking. Everything you need to keep in touch is within easy reach on the 7-inch, TFT screen. Using Voice Control and Bluetooth® connectivity, you can access information and playlists on your mobile too. This is the base setting for comfort and power giving you a direct response with default suspension damping and brake force distribution. With this mode selected you get maximum fuel economy and easy cruising with default damping and brake force to compliment the ride. 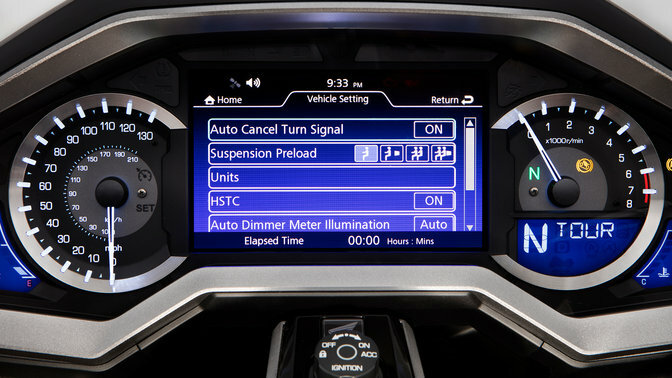 Select this to turn everything down to limit the throttle response for total confidence on a wet and slippery road. It works with the default distribution of braking force and much softer suspension damping. 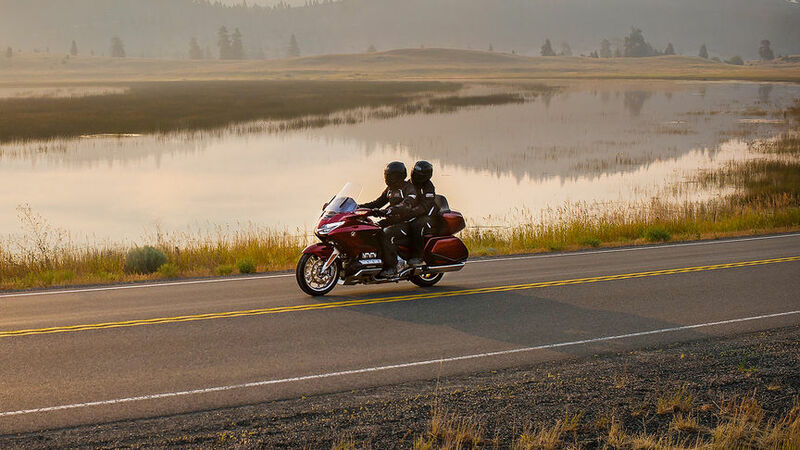 No need to manually unlock the panniers or top box as the Gold Wing senses the remote key fob as you approach. Once pressed, you can keep the key in your pocket, then just press the start button and away you go..
Honda Selective Torque Control in all 4 riding modes, constantly allows controllable acceleration and good traction in slippery conditions. While in SPORT mode it allows maximum acceleration; you can really feel the engine pull – you’ll be hooked from the start. Get yourself ready for departure. 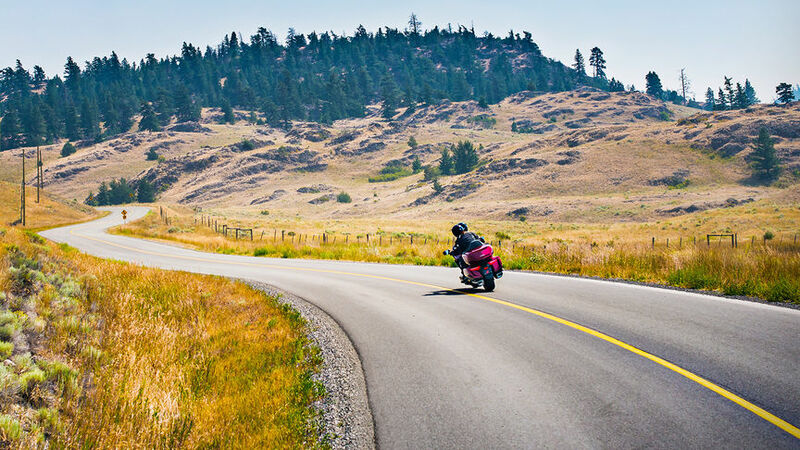 Better keep your passport handy because this is a bike that not only pioneers a new age of touring, but gives you a whole new way of looking at the world. 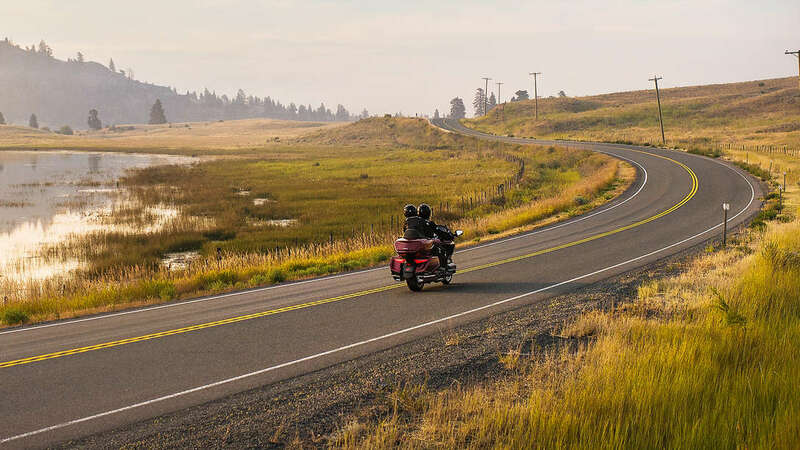 You’ll feel part of the landscape out on the open road; a trip you won’t want to end. 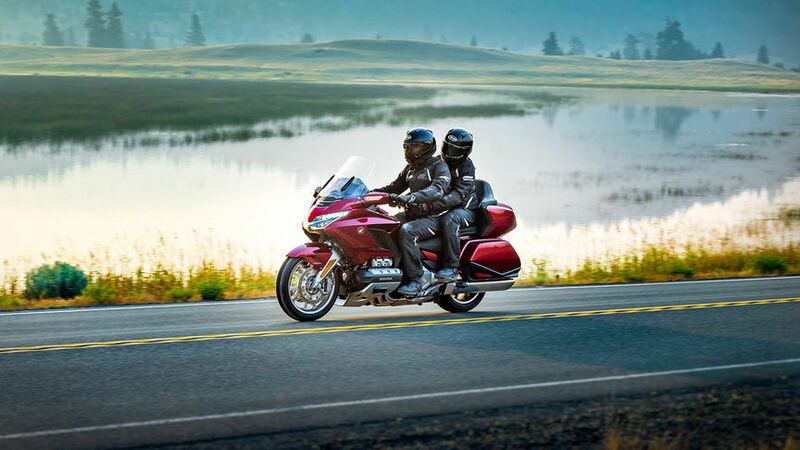 There are three ways to escape: the sleek GL1800 Gold Wing, the GL1800 Gold Wing Tour with top box and the GL1800 Gold Wing Tour with DCT and airbag.